Link poage to Ross Legers British Seagull site in N.Z. There was a New Zealand British Seagull Site - or at least a page of site from the Prospering site. Sadly it no longer works and has been removed. I am pleased therefore to be able to add Ross here to the pages. He can supply spares in N.Z. 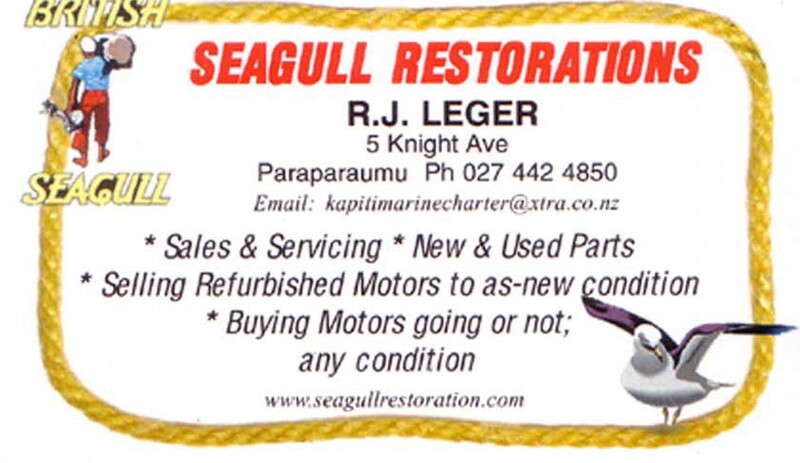 SIMPLY SEAGULLS supplies New Zealand customers with quality new and used parts for British Seagull outboard motors. In stock we have most parts for models ranging from 1942 to 1982. We also have exchange units e.g. gearbox, ignition, power unit, carburetor etc. We have a range of motors for sale. We can put you in touch with service people in New Zealand, or give support to any DIY customers. Although Seagull outboards are no longer in production, our aim is to keep them alive by rebuilding, and recycling parts for distribution New Zealand wide. We have been doing this for over 8 years now and built up a large amount of stock over this time. For any parts enquiry or information, give us a call or email us at seagullparts@xtra.co.nz . We courier all over New Zealand every week day.